MOSUL, Iraq -- Authorities in Mosul have buried more than 1,000 bodies in a mass grave in a desert valley outside the city, most of them believed to be Islamic State of Iraq and Syria (ISIS) group militants, according to a provincial official. More remains are being dug out of the rubble of the district where the fighters made their final stand last year. 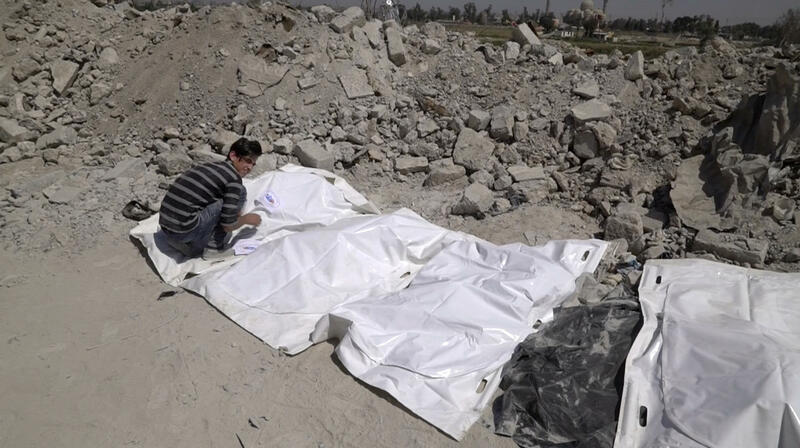 Most of the bodies appeared to belong to ISIS fighters killed by airstrikes or shelling, their remains half-buried. But there were also women and small children. The body of baby girl, turned ghoulish brown, lay on the balcony of a half-collapsed building, covered by bits of rubble. The scene is testimony to Iraqi authorities' lack of resources and the overwhelming task they face in just digging out from the destruction wreaked across Mosul in the 9-month offensive by Iraqi forces backed by the U.S.-led coalition that finally defeated ISIS here. Multiple neighborhoods suffered heavy damage. Clearing of rubble is largely financed by the United Nations' development agency, and repairs are proceeding slowly. In some areas, streets have been cleared but many buildings remain shattered. Maydan is at a further disadvantage because Iraqi officials don't appear to see removing bodies of ISIS fighters as a high priority. The provincial council's office told the AP that clearing the area was the job of the civil defense; the civil defense said it was the job of the morgue; the head of the morgue declined to comment. Faris Abdulrazzaq, mayor of Maydan, said the failure to clear the area -- not just the bodies, but also the huge amount of unexploded ordnance -- was preventing residents from returning to rebuild what they can, as others have in other districts. But the stench of decay rising from the ruins is oppressive, and temperatures are only now starting to rise into the upper 80s Fahrenheit. Even by the awful standards of Mosul, the devastation is shocking in this part of the Old City stretching roughly a half mile along the Tigris River. The piles of dirt, rubble, smashed concrete, metal and vehicle skeletons are so high it is barely possible in many places to tell where the street ended and the buildings once began. Iraqi and U.S.-led coalition forces dropped vast amounts of explosives on this small area to break ISIS fighters' resistance last July in the last weeks of the 9-month-long assault that free Mosul from the militant group's rule. The fighters held out the longest in Maydan, a neighborhood of tiny, winding alleyways and closely built homes. This week, a band of young volunteers wearing plastic gloves worked amid the rubble, pulling corpses cut in half out from under piles of bricks and putting them into white body bags. Some said that occasionally during their work in the past months they've been harassed by security forces asking why they are bothering to deal with ISIS bodies. Iraqi and U.S. officials have never given a detailed estimate of how many ISIS militants were killed in Mosul, only putting the figure in the thousands. Thousands more escaped and continued to fight elsewhere in Iraq or in Syria. An AP investigation last year found that between 9,000 and 11,000 civilians died in the battle to retake Mosul from ISIS, at least a third of them killed by Iraqi or coalition bombardment. The extremists had controlled the city, Iraq's second largest, since June 2014, when they declared their "caliphate" over a third of Iraq and Syria. Nearly all of that territory has been wrested back in the campaign led by U.S.-backed Iraqi and Syrian forces, except for small pockets held by ISIS in Syria.